These Lesson Books feature heavy 120 gsm (31 lb.) chlorine-free paper that is well-suited for use with crayons or ink. The cover is 280 gsm (73 lb.) card stock with leather impression. Portrait or landscape orientation is available. Onion skin page separators protect artwork and written pages. 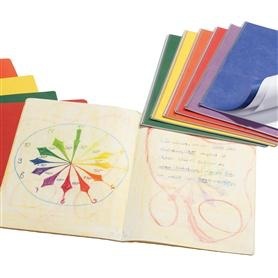 32 pages, portrait format, 32x38 cm (12.6x14.96 inch), blank, with onion skin, spiral binding, 6 colours available.